Views from 2nd Floor Master Bedroom Views from 3rd Floor Master Bedroom Welcome to Moonshadow Cottage 1st Floor Entryway Kitchen w/ all High-End Appliances View from the Kitchen Living Room from Kitchen Two Custom Plush Couches in the Living Area Outdoor Dining and Lounging with Gulf Views Viking Outdoor Natural Gas Grill Your Private Beach Boardwalk 1st Floor Guest Room with Two Twin Beds Wake up to this view from the 2nd Floor Master Bedroom 2nd Floor Master Bedroom with a King Bed and Queen Sleeper Sofa 2nd Floor Master Bath with Double Vanities & Rain Shower 2nd Floor Master Bath with Rain Shower & Tub 2nd Floor Guest Room with Queen Bed 2nd Floor Guest Bathroom 2nd Floor Bunk Room with Two Twin Beds 1st to 3rd Floor Stairs & Elevator across the Hallway View from 3rd Floor Master Bedroom 3rd Floor Master Bedroom with King Bed and Queen Sleeper Sofa 3rd Floor Guest Room with King Bed 3rd Floor Guest Bathroom 3rd Floor Bunkroom Outdoor Dining at Dusk Experience a Sunset like this! 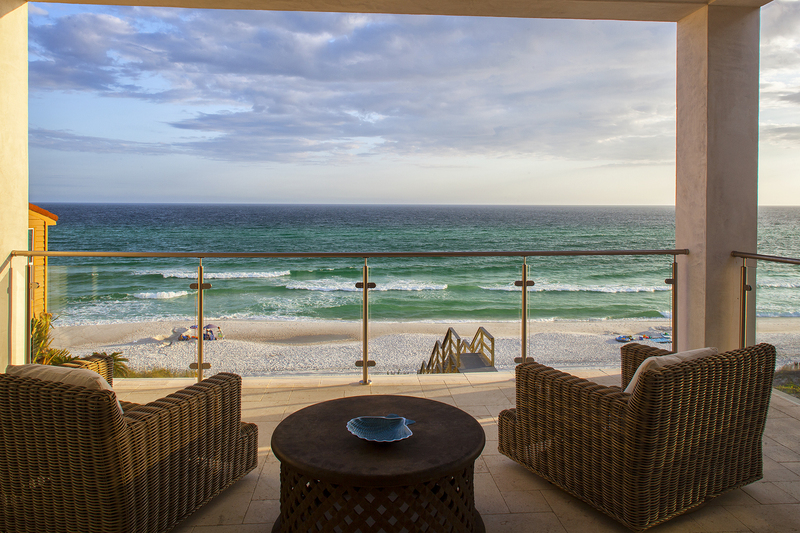 We invite you to experience one of 30A’s newest and most luxurious gulf front rentals. A modern three story, seven bedroom oasis that fuses contemporary design with comfortable furnishings. A sleek beach house so impeccably designed it’s hard to take your eyes off it, even with dazzling ocean views out of almost every window. Welcome to the brand new Moonshadow Cottage in Seacrest Beach! Situated directly on famous 30A with ample entertainment options only a short bike ride away. Entertain the whole family at the HUB, hit the links at the beautiful Camp Creek Golf Club or wine and dine in picturesque Alys Beach. Moonshadow Cottage is close to all the action while offering a tranquil escape once you get back home. Past the large courtyard and garage, the 1st Floor features a guest bedroom with two twin beds and an open concept kitchen, living and dining areas. Large sliding glass doors open up to a stunning outdoor living space with high-end grill, seating, dining areas and private boardwalk to the beach. The kitchen shines with an understated elegance, an oversized island that seats 7 and top of the line fixtures and appliances. A glass and metal staircase leads you past colorful artwork to the second floor which hosts three bedrooms. A bunk room for the kids, a guest room with a queen bed, full bath and private balcony and a master bedroom retreat with gulf views from the balcony and even the bed. The third floor is similarly situated with a bunk room, guest room with king bed, private balcony and full bath and another master bedroom with incredible gulf views from the bed and balcony. All bedrooms come with large mounted flat screens. Both master bedrooms have king sized beds with queen sleepers, heavenly bathrooms, comfortable sitting areas and oversized balconies with breathtaking gulf views. High-tech luxuries like a state-of-the-art HDTV and an integrated Sonos sound system can be found throughout. A beachy-chic color palette and abundance of windows floods the space with natural light that sparkles as it hits the polished accents. A genuinely impressive addition to 30A, the Moonshadow Cottage is an instant classic! Thank you for your feedback and for giving us the highest possible review. We hope to see you again! This house was fabulous and far exceeded our expectations. However, I think the most amazing part was dealing with 30A. I take my family someplace new every year and deal with different management companies every year. 30A was the best yet. Thank you for making 30A Luxury Vacations your preferred vacation specialists! Our staff is comprised of experts in the boutique hotel industry and property management; we are delighted to know our team exceeded your expectations. We would love to accommodate you and your family again. Please let us know if there is anything we can do to assist you in booking your future stay! Lovely home in a wonderful location. Loved the 2 Master Bedrooms and the porches. 3 bedrooms required going into another bedroom to shower. This was a surprise and added unexpected complexity to teens that could have used privacy. Moonshadow Cottage was AMAZING! Family vacation with 9 adults and 4 kids and there was plenty of room and amazing memories made. Only complaint is that there is not an outdoor shower as indicated on the property page (that we found at least) - however, there is a water hose that you can roll out from the patio and use (not as convenient as a true outdoor shower). We loved our stay on 30A at Moonshadow Cottage! Thank you for such wonderful accommodations. This place was perfect for our family of 12. The beach view and access were some of the best that we've experienced in some 20 years of traveling from Texas to this beautiful area. The home is very functional and we all loved it. You get a feel for a place after staying there for seven days. Thanks. Thank you for taking the time to leave your review of Moonshadow Cottage! There is nothing like having a cup of coffee or an afternoon BBQ with the patio grill with a perfect view of the beach. We are so happy to hear you and your guests loved this home. We hope to have the opportunity to accommodate you again! The home is wonderful!!! Lovely, immaculate, well stocked and furnished! 5stars plus!!! Thank you for the delightful feedback! We are pleased to hear you enjoyed this exceptionally exquisite beachfront home. The team at 30A Luxury Vacation is looking forward to booking your future stay! I believe we were the first family to stay in the Moonshadow. We loved the house but had a few issues - the A/C hadn't been installed correctly on the third floor so we had a few uncomfortable nights until we called the management company. The TV's hadn't been programmed. We got a quick response when we called with our issues. Lots of the dishes in the kitchen still had store stickers on them. Hopefully, the owners will have some time to really finish the house. We enjoyed the bikes, the beach chairs, the cleanliness of the home and the views! Perfect location! We wouldn't hesitate to stay at the Moonshadow Cottage again. Thank you so much for staying with us and we are so happy you enjoyed the wonderful Moonshadow Cottage!! We sincerely appreciate your feedback and work very hard to make sure our guests have zero issues during their stay and apologize for the items you let us know about. We are very sorry that there was a small HVAC issue during your stay and we are so happy we were able to have it resolved within a few hours of your calling us. We are also sorry that the 3rd-floor bedroom TV was not hooked up properly, but we're more than happy to get that remedied for you right away as well. And thank you for letting us know about the stickers on the some of the dishes. Thank you for letting us know how much you enjoyed the bikes, beach chairs and how clean the home was and of course those amazing views!! We look forward to accommodating you and your family in the future at the Moonshadow Cottage and please don't ever hesitate to let us know if we can ever do anything for you! Wonderful new home. The beach was perfect with a sand bar out front that was great for the kids. There were a few minor glitches but they were dealt with immediately. Had a really fun time vacationing here. Wanted to do something different for a corporate retreat. Moonshadow is a fabulous property and a great get away venue for work and play. Crazy good!!!! We will stay at the Moonshadow Cottage again!!! 16 ladies rented the house as a surprise for 2 friends turning 40 and we had a great time! Plenty of beds, all the dishes, coffee supplies, etc.. that we needed. Views unbeatable.. outdoor furniture was so nice. We all loved it and would recommend to anyone. Managers were very helpful and attentive to the couple of requests we had.. It was absolutely wonderful. No problems; except for inviting too many family members.